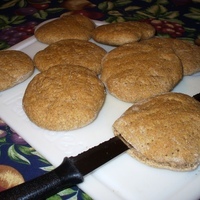 FOR BREAD MACHINE DOUGH METHOD: Reserve 1/4 cup of the whole wheat flour; set aside. Place remaining ingredients in dough canister according to machine manual. Select Dough setting for 2 pound size. Press Start. As machine mixes and begins kneading, if dough is very sticky add as little as required of the reserved 1/4 cup flour. At end of dough cycle (mine took 1.25 hours) punch dough down and continue with Step 5 below. FOR CONVENTIONAL YEAST DOUGH METHOD: Combine thoroughly in large mixing bowl 1 1/2 cups of the whole wheat flour, wheat bran, undissolved yeast, vital wheat gluten, and salt. Heat water, honey and oil until very warm (120 to 130 degrees F.). Add to flour mixture with the egg and beat until well mixed; let rest 5 minutes. Beat in 1 cup wheat flour until well mixed. Stir in just enough of the remaining 3/4 cup flour until soft dough forms (it will be lightly sticky on surface.) Knead on lightly floured surface for 5 to 6 minutes. Cover and rest dough 10 minutes. Cut into 16 to 18 equal size portions, about 2 ounces each. Roll or pat each dough ball into a 3 1/2-inch circle on lightly floured surface. Place on greased baking sheets, leaving 1 inch space between each. Prick each bun multiple times with a fork (to ensure even rise.) Lightly brush with water. Cover and let rise in warm draft-free place for 30 minutes until puffy. Cool completely on wire rack. Carefully slice bun in half horizontally and fill with favorite sandwich fixings. I can't wait to try this recipe. I will follow the conventional method. My son likes the sandwich rounds for school lunch. They are pretty expensive so I can't wait to see if he likes these, they look so yummy! Thanks for sharing! Thanks Denise for your comments. I could not believe the difference myself in store-bought vs. homemade sandwich thins. I dream of what new fillings to try next! I have given so many away, it's time to make a fresh new batch! Haha I do that too, I wind up giving so much away. But it's nice when others can enjoy it too. I'm hoping to make them very soon, I need the vital wheat gluten, my grocery store doesn't have it so I have to get to Wegmans. My son is very excited that we are going to try making our own. I will let you know how it turns out. Thanks again! If you'd like to get just a little vital gluten instead of having to buy a whole box of it, try grocers that carry flours in bulk bins. Whole Foods, Winco and natural food stores usually carry it next to the flour. I use it often because I use whole wheat flour a lot in baking breads and it's needed for holding the structure during the rising period. Good luck!